It's not too early to book your spring and summer get-away! If you are looking to get away from it all and enjoy a serene and quiet retreat, our home is perfect. Pet friendly! We do welcome pets with a flat fee of $25 per pet/per stay. Three dog limit. Quiet cove, wooded lot, great lakefront location. Most of the other homes in our cove are second homes so oftentimes you have the cove to yourself! 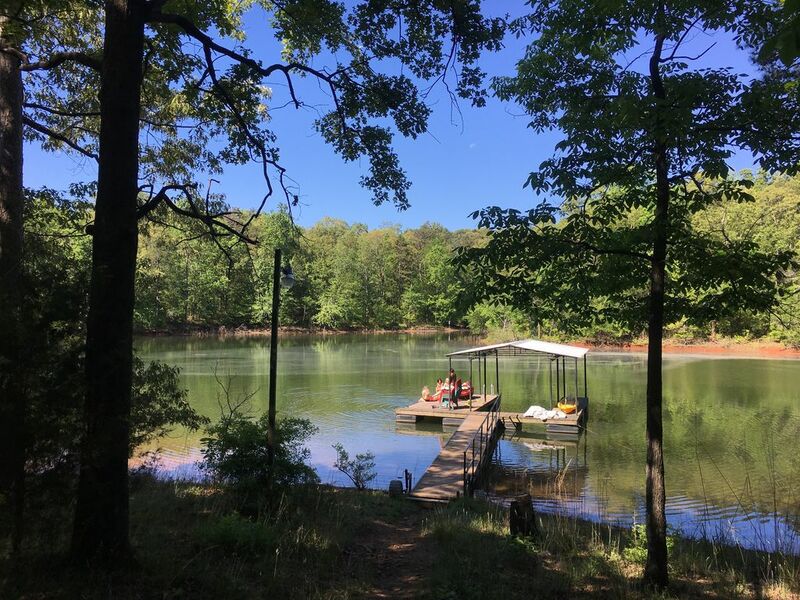 Adults, kids and dogs love our location on Lake Hartwell. Swim in our cove, fish off the dock, moor your boat or jet ski on our dock, paddle in our two-person kayak, or just enjoy a meal or cocktails on the screened porch. We are approximately 1 hour & 45 minutes from downtown Atlanta and 1 hour from Greenville. All the bedrooms can be closed off for privacy and kids’ earlier bedtimes. The cabin comfortably sleeps 8 (1 King, 1 Queen, and 2 bunk beds). The outdoor area includes chaise lounges, a fire pit and charcoal grill. A gentle slope takes you down to the dock and shallow kids’ play area. We are also very close to the big water if you bring your own boat or Jet ski. The cabin is five minutes by car from Carter's Ferry Boat Ramp, 10 miles (20 minutes)to historic downtown Hartwell, and 9 miles to Hartwell Marina. There is a fully refundable security deposit of $500 if no damage. The housekeeping fee is $115. We bought this cabin so that our little girls would have an escape from the city to experience nature and the country. After purchasing the house, we quickly renovated it, adding the living room and master bedroom so that we could have friends and family stay with us. We hope that you will enjoy our cabin as much as we do! Lake Hartwell has the unique combination of easy accessibility to major metropolitan areas and a quiet, remote location. Even on major holidays, such as July 4th, you feel like the lake is your private playground since there are so few people! We love our quiet cove! There is no need to worry about jetski or boat traffic near our dock so kids can swim and relax without worries. The gently graded and short walk from our house to our dock makes the transport of coolers, towels and supplies an easy task. Our lot is wooded so you have lots of privacy. We renovated and decorated our home for a lakeside feel with fishing prints and country antiques. We love to cook so our newly renovated kitchen is fully stocked with everything you need to make a memorable meal! The wood-burning fireplace makes for a cozy getaway in the Fall and Winter as well. Owner is a licensed realtor in Georgia. Screen Porch for dining and relaxing, hammock, picnic table, dock with swim ladder, kayak for guests' use. The extra care taken to provide basic pantry staples, details of what the lake has to offer, and a perfect, clean relaxing home was noticeable. We will be back for sure. We had a wonderful visit. Hope to come back soon. Thank you Evelyn! We were so happy to have you and look forward to your next visit! House is everything in the add. Only draw back is the driveway is tight if you have a boat trailer. But there is parking out by the street. Even though we were mainly here to go to the Clemson game (we have 3 kids at Clemson), tailgate before & afterwards, & spend time with our children, it was wonderful to come ‘home’ to this lake house. It is in a secluded area with the colors of Fall all around as well as the sounds of nature. The house was well-stocked with kitchen items, was comfortable to relax in, and was plenty of room for us 4 adults. We look forward to coming again during the summer months to boat & to really take full use of the lake. Stephane is a very gracious host who answered my questions in a very timely manner. Thanks for having us!! !